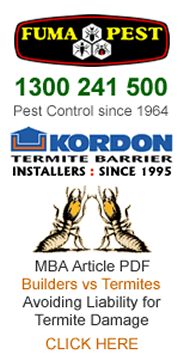 FUMAPEST Penrith Pest Control 1300 241 500 are termite pest control specialists since 1964 in the Penrith Council region. Subterranean termites cause extensive damage to structural and decorative timbers in homes throughout NSW. Remember: Home insurance does NOT cover such damage.